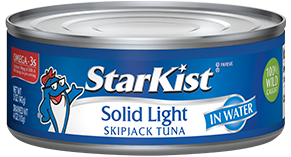 StarKist® Solid Light Skipjack Tuna in Water is carefully packed and cooked to preserve the naturally mild, trusted tuna flavor people have come to expect from StarKist®. Each can contains a solid fillet of 100% wild caught skipjack tuna that is naturally lower in fat and cholesterol than beef or chicken*. Refreshing in a wrap, salad or even right out of the can, StarKist® Solid Light Skipjack Tuna in Water makes it easy to incorporate seafood into your diet.